Day 1 - October 31 Depart SFO. Day 3 - November 3 Fly from Manila to Coron and stay 2 nights in a King Room at The Funny Lion in Coron . Day 4 - November 4 Coron Island Tour (to visit Kayangan Lake, etc.). Day 5 - November 5 Take a ferry to El Nido and stay 3 nights in Water Cottage at Lagen Island Resort in El Nido. Day 8 - November 8 Fly home via Manila. Click here to review the voucher. Print it out and show it to the Funny Lion hotel upon check-in. 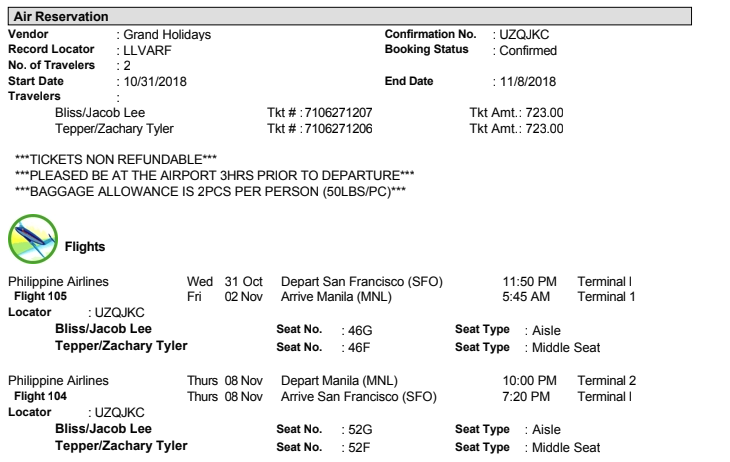 Here's a little guide I put together for you on Manila. Click here for more information and how to prepare for International Travel.